The central hall of the Palau Güell was designed by Antoni Gaudí as a musical space where concerts, dances and even mass were held. 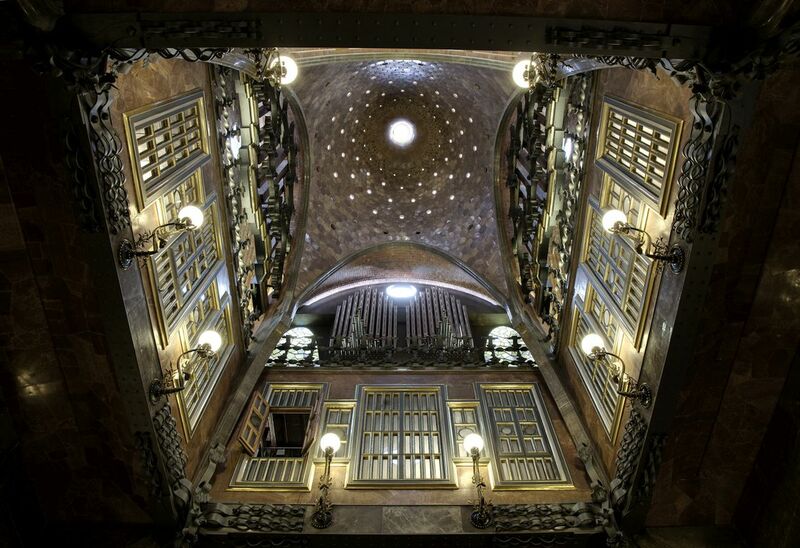 That is why the prestigious spanish organbuilder Aquilino Amezua built an organ, which was played by Isabel Güell, the daughter of the owner Eusebi Güell, an organist who received training in Paris from the illustrious organist Eugéne Gigout. The console was down at the main hall while the organ stood on the ceiling of the room about 10 meters high. On the occasion of the restoration of the Palau Güell, having disappeared the original instrument from which only the console and the lateral facades are preserved, it was decided to build a new instrument that had to respond to very different needs to those of late nineteenth century. The space has gone from being a private space to a public space, one of the main buildings of Gaudí with a continuous flow of visitors and where cultural activities such as conferences and concerts are also held. For this reason, it was decided to place the console next to the organ, which allows the organist to perform more accurately. It was also equipped with a system of automatic reproduction that sounds the organ every half hour, creating a very good sound climate giving a plus of quality to the visit. This organ can also be discovered in an unpublished function: the show “PARABOLIC GAUDI”, fusion of mapping projections in the dome of the central hall, with the sound of the organ executed by a poetic and vertiginous composition by the video artists Santi Vilanova & Eloi Maduell. The role of the organ in the Palau Güell is completed with visits and school workshops where the children end up building a wooden organ wood pipe of a high quality, after which they receive the diploma of “Little Organbuilder”.